By Alejandro Rodriguez. Last revised Sep 29, 2018. What is extracted game music? Q: How can I convert select songs from multiple soundtracks at once? For starters, as the name suggests, 'extracted' means it's taken out of something. Devote classic gaming fans dove into the programming of video games and pulled out the songs. With the proper software, you can play these songs as if they were MP3s! Cool huh?! These music files are sequenced music, like MIDI music or chiptunes. Their memory size is incredibly small! Being that these are the actual programming of the songs, you're hearing them at their best possible quality! Every library of music is a complete collection! For example, the library for Super Nintendo SPC music contains the soundtrack for every Super Nintendo game. You would get to have soundtracks that would otherwise be impossible to own! They can be played on PC, Mac, Android, & Linux! They can be converted to MP3! Let's roll back to the early 2000s. Back then, the Internet was slower and our computers didn't have a lot of space. Classic gamers relied on MIDI music to get their gaming music fix. They went to websites such as VGMusic.com regularly to check out what new MIDI music was added. MIDI music was cool, but it wasn't the best because songs didn't sound like the real thing. Then extracted game music came out. It was the perfect solution for classic gamers to get their music fix. They offered the space-saving benefit of MIDI music, plus they sounded exactly like the real thing (because it was the real thing!). The popularity of extracted game music eventually declined in the late 2000s when MP3s became standard and we all obtained high-speed Internet to download MP3 soundtracks with ease. Still, the space-saving benefits of extracted game music remain valuable even today. At the time I'm writing this, mobile devices typically come with 16-32 GB of space. Filling up your mobile device with MP3 soundtracks for your favorite games could take up maybe 5-10 GB of your precious space. Or you could take up only 50-100 MB of space with the extracted game music equivalents of those same game soundtracks! WinAmp is a fully featured music player, which also can play extracted game music once the plug-ins are installed. This is the player I recommend. 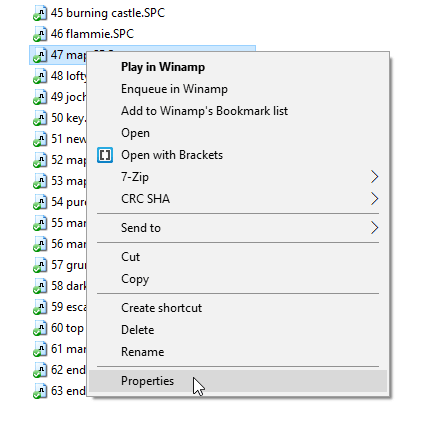 Keep reading for directions on how to download, install, and setup WinAmp. The Windows port of ZXTune is pretty good, too. Quite a few people prefer it over WinAmp. It can play extracted game music right out of the box. Its playlists feature is handy. Audio Overload is a specialized music player that can only play extracted game music. It's a basic music player with no special features. Ever heard of WinAmp? It used to be extremely popular as the #1 music player. Its popularity declined when we moved away from our PCs to our smartphones for playing music. The cool thing about WinAmp is that it accepts custom-made plug-ins. Hence, the classic gaming community created special plug-ins that give us the ability to play extracted video game music with WinAmp! 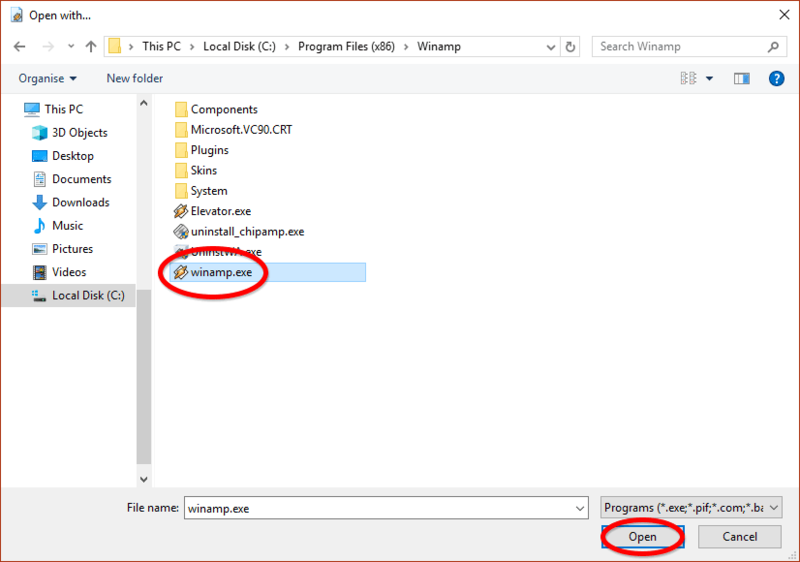 To make installing these plug-ins easy you, the gaming community created Chipamp, which automatically installs ALL extracted music plug-ins into WinAmp with one easy install wizard. So all you need to do is download WinAmp and Chipamp, which you can grab below. First install WinAmp (make sure to choose the Classic skin), then install Chipamp. When you download a game soundtrack, it'll be in either ZIP, RAR, or 7Z format. So you need to extract the extracted video game music. 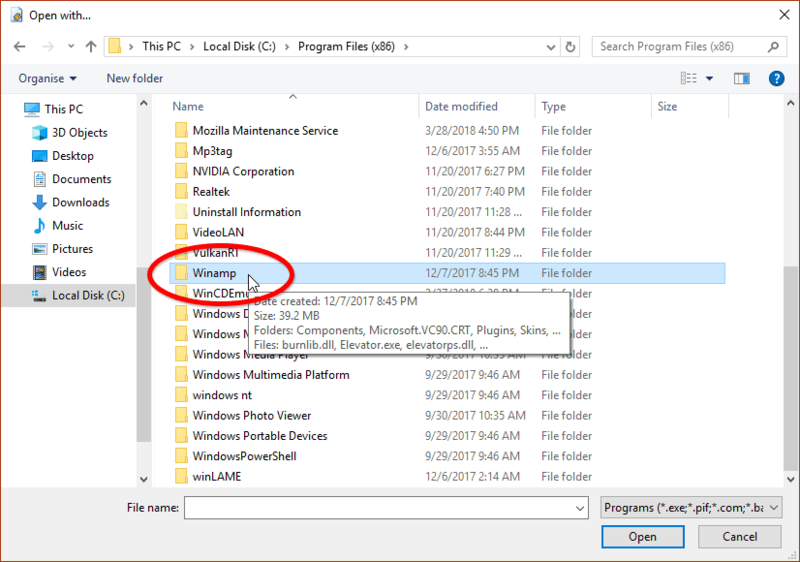 On Windows: Windows can extract ZIP files by default. RAR and 7Z files can be extracted with 7-Zip (which is free). Using 7-Zip is incredibly easy. 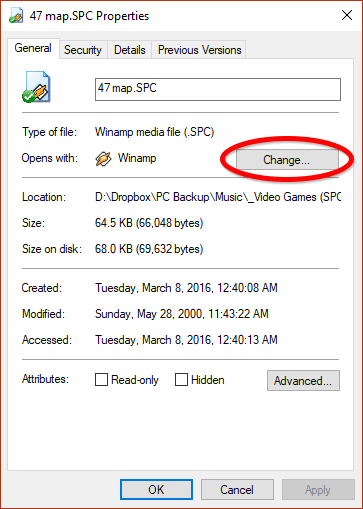 Once installed, simply right-click a RAR or 7Z file and go to 7-Zip > Extract Here. On Mac: Mac OSX can extract ZIP files by default. RAR and 7Z files can be extracted with Keka (which is free). On Android: Most file manager apps such as Astro File Manager can extract ZIP files. ZArchiver can extract RAR and 7Z files. And both of these apps are free. Right-click the music file and go to Properties, as shown here . The Properties window will pop up. Click Change. The Open With window will pop up. 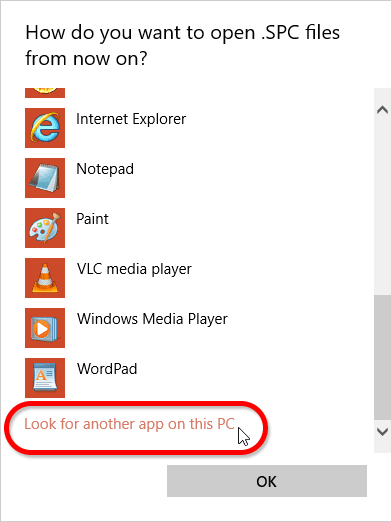 Click More Apps then Look for another app on this PC. 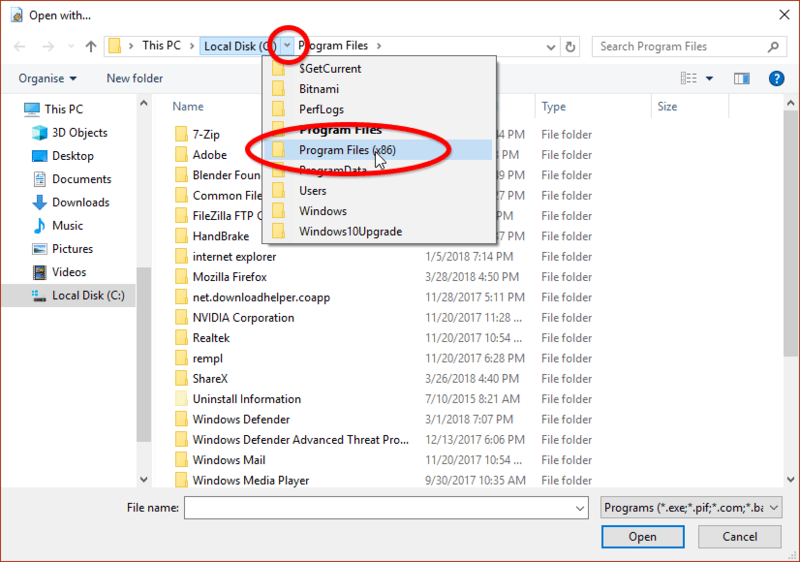 As shown here , click the down arrow next to "(C)" and click Program Files (x86). As shown here , scroll down and double-click WinAmp to open it. As shown here , click on "WinAmp.exe" and click Open. Click Okay, Apply, Okay yadda yadda and you're done. From now on, that music format will open up in WinAmp. This must be done (just once) for each format of extracted video game music. Chipamp was last updated in the early 2010s, so newer formats such as Sony PSP (AT3) music and PlayStation 3 (PSF3) music are not supported. For playing those formats, there's VgmStream. It's a command line driven program, though, so it's not very user friendly. I need to direct you to YouTube for help because I haven't explored this yet. The same guy who ported over all of Mac's best video game emulators, Richard Bannister, also created a special music player for any extracted video game music format. It's called Audio Overload. You've got options on Android. The three most popular extracted game music players are ZXTune, Modo, and Droidsound. Modo has some neat features, but overall I think ZXTune is the best. ZXTune makes it the easiest to browse any type of music format. This is important because formats such as Super Nintendo RSN contain the songs inside the file. iOS has one app: SnesMusic. Despite having “SNES” in its name, it actually plays more than just SNES music. It also supports Game Boy, GBA, NDS, PSX, N64, NES, TG16, Game Gear, and Master System. Audacious (a popular Linux music player) comes with extracted game music support by default. There's also the Linux ports for ZXTune and Audio Overload, music players dedicated to extracted game music. It's possible to use WinAmp with Wine, but that could be tricky to get working. In my FantasyAnime's shrines for SNES RPGs, you'll notice a download for the SPC soundtrack and a download for the RSN soundtrack. So what's the difference? Well, it depends on your preference. SPC's consist of individual songs. You might prefer this if you're accustomed to playing MP3's. The only drawback with SPC soundtracks is that not all songs have a proper end time configured, which only poses a problem when you want to convert the songs to WAV or MP3. The SNES plug-in SNESamp defaults songs with no end time to 3 minutes. You can adjust this; check out Important Notes for directions. Click Previous Track & Next Track . Bring up the WinAmp Playlist window to browse and choose a specific song. To do so: right-click WinAmp and click Playlist editor, as shown here . They're both the same thing. Their difference is in how they were prepared. GYM songs are sloppy. Not all of them begin and end properly. To make matters worse, the WinAmp GYM plug-in is buggy and crashes easily. VGM songs are perfect, just like soundtracks for all other extracted game music formats. After clicking to open an extracted music song, wait for a second or two before clicking the next one. If you open the next song too quickly then nothing will happen, or WinAmp might stall or even crash. This applies to Super Nintendo SPC, Nintendo NSF, and Genesis GYM music. Most music ends at its proper time, just like an MP3. However, not all do. Having no end time poses a problem when you want to convert the music to WAV or MP3 because you'll end up getting a soundtrack with every song ending at 2 minutes. With Super Nintendo SPC music this isn't a problem because you can just download the Super Nintendo RSN soundtrack which has proper end times. But with Genesis GYM and Nintendo NSF, you're screwed. Once in WAV format, you'd have to download an audio editor and end the songs manually. Right-click WinAmp, click Options, then Preferences - as shown here . You'll arrive here. As my little diagram shows: (1) scroll down this list, (2) click Input, (3) click Alpha-II SPC Player, (4) click Configure. Click the Time tab, as shown here . Where it says "Auto End" is where you can adjust the end time. Here's how you can convert extracted video game music to WAV files. This is done in WinAmp. Open WinAmp if you haven't already. Also, if you have Repeat (Loop) enabled, disable it. You'll arrive here . As my little diagram shows: (1) scroll down this list, (2) click Output, (3) click Nullsoft Disk Writer, (4) click Configure. *If you don't see Nullsoft Disk Writer on this screen, you can download it here (it's 191 KB). Here in the configuration screen , you can choose where you want the WAV files to get tossed to. In this case, I have it so that they appear on my desktop. Click OK when you're done and close the Preferences window. WinAmp is now configured to export anything is plays to WAV! Go ahead and open a song you want to be converted. WinAmp will look as if it will play the song, but instead, you'll hear silence and the is just speeding across. When it reaches the end the conversion is complete. That's it! It's quick and easy, huh? When you're done you need to go back to Options > Preferences > Output and switch WinAmp back to Nullsoft Direct Sound Output so that it can play music again. Once you enable WinAmp for WAV output, simple play the first song and WinAmp will automatically convert every song in the soundtrack to WAV. You need to drag all the songs of the soundtrack into WinAmp's Playlist Editor to build the queue of songs that will be converted. If you'd like, you can drag songs from other soundtracks as well. Then enable WinAmp's WAV output and play the first song in the list to convert them all to WAV. First, you need to convert the video game music to WAV, as I just explained above. Open WinLAME. Click on the button, look for the folder where the WAVs are, select them all, then click on Open. You should see the WAV files you selected listed on the white box. Click Next to go to the next screen. You'll arrive at the "Output Settings" screen. Under "Output Module" it should say LAME mp3 Encoder, as shown here . Click Next to go to the next screen. You'll arrive at the "Presets" screen. The default is fine, just click Next to go to the next screen. You'll arrive at the "Encoding" screen. Click to begin the converting. Right-click the MP3 file then left-click on Properties. Click on the Details tab, as shown here . All these fields you see can be edited - click on a field to type text in it. Click OK when you're done. Download Mp3tag and install it. Click on to choose the folder that contains the MP3 files you want to edit, then click on Select Folder, as so . Now select the MP3 songs you want to batch edit. Either press Ctrl+A to select all of them, or hold down the Shift key to select a specific set. Take notice of the left part of the screen . Here you can fill in any fields you wish. You might see a "<keep>" label in some fields; leave that if you want the selected MP3 files to keep that field with the existing label. When you're done, click and your changes will be saved. If you made a mistake - that's ok; just repeat the process to correct it. 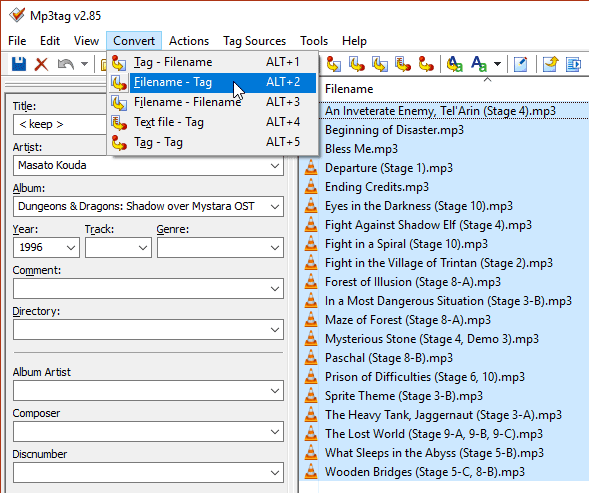 Mp3tag has a useful feature that automatically populates the Title field of every song with the filename. To use it, first you need to select all the songs. Then go to Convert > Filename - Tag, as shown here. The directions in this guide focus on Windows. However, it is possible on Mac OSX to convert extracted game music to MP3. ZXTune and Audio Overload have the ability to convert extracted game music to WAV. Then you can use iTunes to convert the WAVs to MP3 as well as fill in the MP3 tags. SNESmusic.org - The #1 resource for Super Nintendo RSN soundtracks. PSF Mirror - The #1 resource for Playstation PSF soundtracks. USF Central - The home of the Nintendo64 USF format. They offer every available USF soundtrack. It's not very clear, but to download a soundtrack you need to click on the memory size of the soundtrack. Project 2612 - The #1 resource for Genesis VGM music. Zophar's Domain - The #1 place for downloading music for every system! They also include MP3 soundtracks for every game. When you click to view a game, you'll see two options: “Download all files as MP3” and “Download original music files”. To download the extracted game music files, click on “Download original music files”. So you have a bunch of individual songs from multiple soundtracks and multiple video game systems, and you don't want to have to click on each one to convert them all. You're going to run into one of two scenarios here, depending on the different systems you have music for. RSN/NSF/GBS is a little tricky. As you should know already, you can browse among a single RSN/NSF/GBS soundtrack in WinAmp's Playlist Editor. You can remove RSN/NSF/GBS songs from the Playlist Editor to make a custom playlist for conversion. If you double-click to open another RSN/NSF/GBS soundtrack, the Playlist Editor refreshes and removes the custom work you've done. If you drag & drop an RSN/NSF/GBS soundtrack to the Playlist Editor when one is already open, it embeds itself in the list as a single item and hence cannot be customized for custom conversion. PSF/USF/SPC/GSF/VGM songs are not an issue at all, you can just simply drag & drop your desired PSF/USF/SPC/GSF/VGM songs to the Playlist Editor along with whatever RSN/NSF/GBS setup you already have. *Super Nintendo RSN soundtracks are an exception because those are actually SPC songs in a RAR file. If you extract the RSN, you can convert multiple soundtracks by dragging all the RSN-extracted SPC's to the Playlist Editor. Bring up WinAmp's "Playlist Editor". To do so, right-click WinAmp and click Playlist Editor, as shown here . Simply drag & drop the songs you want to convert to the Playlist Editor window. Set WinAmp to convert, then double-click on the first song to start converting the list.